The patient presented with many of the tell tale signs of aging. Her upper eyelids were heavy and actually hanging on to her lash line. Her lower lids had excess fat causing her to have an appearance of bags under the eyes. Her skin was sun damaged and uneven in tone and texture. She had many fine lines and wrinkles, particularly around the mouth. Note her jawline is also less defined due to sagging of the cheeks. The patient underwent both an Upper and Lower Blepharoplasty, Erbium laser resurfacing of the full face and neck liposuction. The Blepharoplasty has opened her eyes very nicely, making her appear more awake and refreshed. The Erbium laser resurfacing has smoothed out the fine lines and wrinkles. The Neck Liposuction has helped define her neck and jawline. How Do I Recognise The Early Signs Of Ageing? Many people try to slow down the ageing process with the proper skincare routine or by getting professional skincare treatments and procedures at The Dr Lanzer Clinic; this can be done to tackle a large variety of common ageing signs. As we age, our skin starts to change, which leaves some visible signs. While we are all familiar with the typical fine lines and wrinkles, there are other common signs of ageing to look out for. To find out what they are, be sure to read the information below. How Is Dry Skin A Sign Of Ageing? Even though we can suffer from dry skin throughout our lives, dry skin is actually a common sign of the natural ageing process too. In some cases, genetics can play a role, which can make a problem such as dry skin more difficult to tackle. There are some things that can be done to tackle a problem such as dry skin. One of the changes that can be made is your diet. Ensure you drink plenty of water during the day and add some water-rich fruits and vegetables to your diet; this can include anything from cucumbers to tomatoes. To tackle a dry skin, you will require a good moisturizer too. There are plenty of moisturisers out there that could rehydrate your skin, but some are better for your skin than others. If you are unsure which one would be best, you can always speak to your dermatologist. How Is Pigmentation A Sign Of Ageing? The natural ageing process can also cause age spots, also known under the name hyperpigmentation. These spots can appear anywhere on the body, but most commonly on areas that have been exposed to direct sunlight for long periods of time. Hyperpigmentation or age spots are caused by an accumulation of melanin over time; this is caused by repeated exposure to the sun over the years. If you have not protected your skin accordingly, it could lead to problems with age spots. Some of the dark spots experienced as a part of the natural ageing process can be prevented, more specifically by ensuring your skin is protected properly against the sun. Even in the winter, you should always apply your sunscreen. Even when the sun is hidden behind the clouds, your skin will still encounter sunrays. So, always apply a sunscreen with a minimum of SPF 30. How Is A Loss Of Skin Elasticity A Sign Of Ageing? As we age, the skin can lose a lot of elastin; this is the compound in the skin that keeps the skin flexible and elastic. As the elastin disappears, it can lead to those pesky fine lines and wrinkles. There are certain things you can add to your diet to promote the production of elastin; this includes food that contains healthy fats and amino acids. Foods that are rich in antioxidants are also good for the elastin maintenance in the body. Even though you can maintain a healthy diet, sometimes there is not enough elastin to keep your skin in good condition. When this happens, it could be an idea to look at skincare treatments available at your cosmetic surgeon. 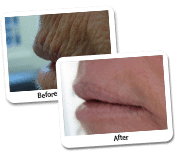 A good example is laser resurfacing; this is a treatment where certain layers of the skin are evaporated. By causing damage to the skin, the body responds by creating compounds such as collagen to restore the skin. Naturally, the production of such compounds has a rejuvenating influence on the skin, reducing fine lines and wrinkles as well as skin abnormalities. How Is Tired Skin A Sign Of Ageing? It is not uncommon for people to mention how their skin has lost its “lustre” as they have aged. The so-called lack of lustre – or having a tired looking skin – can be explained by some of the compounds that are lost through the natural ageing process; this includes compounds such as collagen and elastin. Getting a treatment such as laser resurfacing at The Dr Lanzer Clinic can reinvigorate the skin; this since the body is forced to produce rejuvenating compounds to repair itself after the treatment. There are also additional things you can do at home; this includes enjoying a balanced diet and having a good skincare routine. Do I Need Surgery To Regain My Youthful Appearance? There are surgical and non-surgical treatments available for patients who wish to address some common signs of ageing. The type of treatment that will be most beneficial to you will depend on the problems you are trying to correct. For example, if hyperpigmentation is your main concern, a non-surgical treatment such as laser resurfacing may be preferred over others. Of course, the best way to determine the right treatment is by attending a consultation with Dr Lanzer. To book a consultation, simply contact our friendly team of receptionists by telephone.